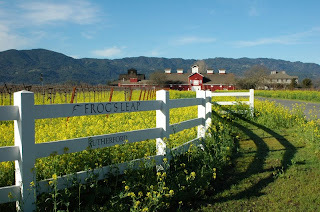 Frog’s Leap stands tall in the heart of Rutherford, at home in its historically noted “ghost winery” Red Barn. It’s Zinfandel is considered America’s own great indigenous grape, even though its origins lie on the Adriatic coast. Planted throughout California and the Pacific Northwest, Zinfandel is at its best in warm regions with cooler temperatures during harvest. The wines can range from off-dry Rosés, White Zinfandels, and light bistro styled wines, to big, rich powerful wines – even luscious wines for dessert bottling. The flavors range from plummy to raspberry, although deep blackberry fruit and brambly spice tones are most common. True to their tradition, the Frog’s Leap Napa Valley Zinfandel 2006 is a field blend that relies on the vitality of zinfandel (87%) and the depth of petite sirah (10%) for its trademark character. It was aged for 12 months in American oak. Zinfandel’s intense aromas of wild berry and fresh fruit are punctuated by spices that include clove, cinnamon, and white pepper. Lush layers of cherry and boysenberry fill the palate, while the nuances of oak and earth never overwhelm. The wine’s bright acid and soft tannins offer a plush, lingering finish. It is rich yet quaff able. Frog’s Leap 2006 Zinfandel is a wine that both complements a meal like Smoked Chicken and is delicious completely on its own. You try this wild berry wine online from wines.com!